Girl's Bass Method, Everything a Girl Needs to Know About Playing Bass! 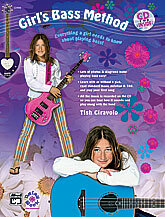 (Book & CD) (Bass Guitar), #YL00-22900 : By Tish Ciravolo : Bass Guitar Method or Supplement : Book & CD : Girl's Bass Method : Everything a Girl Needs to Know About Playing Bass! From Tish Ciravolo; president and founder of Daisy Rock Guitars; comes the first bass method written especially for girls! In the tradition of the immensely popular Girl's Guitar Method; the Girl's Bass Method speaks to girls by teaching from a girl's perspective; with a style and design addressing the interests of young women today. This is a solid method that teaches how to read standard music notation and TAB; play in several different keys and styles; perform slides; accents; and syncopated rhythms and more. The included CD features recordings of all the music in the book for listening and playing along. 48 pages.